The past month has seen territorial gains both for Syria's Assad government and for rebel forces, while the so-called "Islamic State" (ISIS/ISIL) has mostly held its ground. See all this and more on the latest update to PolGeoNow's concise, professional Syrian Civil War control map, which includes a timeline of changes since our previous Syria map report in late June, with sources cited. 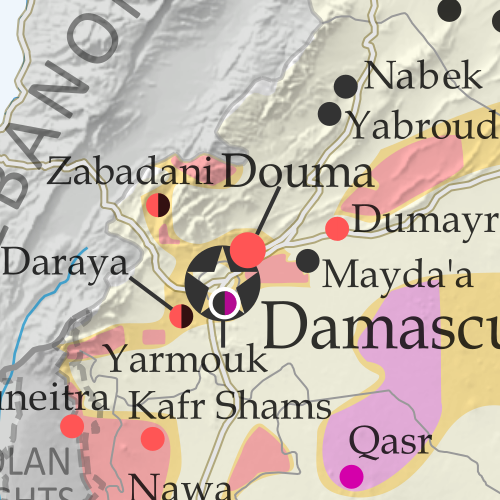 This map and report are premium professional content, available to paid subscribers of the PolGeoNow Conflict Mapping Service. Up-to-date map of current territorial control in Syria, color-coded for the Assad government, rebel groups, "Islamic State" (ISIS/ISIL) fighters, and Kurdish/SDF forces (color blind accessible). Special symbols indicating towns dominated by rebels of Al Qaeda affiliate Jabhat al-Nusra (the Nusra Front) and US-backed Syrian Democratic Forces (SDF). Detailed indication of city-by-city control, highlighting key towns and other locations important to current events. Locations of recent fighting and military operations, including Manbij, Abu Kamal (Al Bukamal), Daraya, Kinsabba, and more. Detailed timeline of important events and changes to territorial control since June 26, 2016, compiled by our Syria-Iraq expert, with links to sources. Not a member yet? Click here to learn more about our professional subscription service! Categories: al qaeda, asia, conflict zones, divided countries, isis, kurdistan, middle east, premium, rebel control, syria, the "islamic state"